Health and safety is a property of the system. Traditionally health and safety has been defined as the absence of injuries and illnesses. If there are very few injuries or illnesses the workplace is considered safe. When someone asks, “how are we doing?”, the OSHA recordable and lost time case rate charts are trotted out. Company leaders and safety and health professionals have been lead to believe that these rates measure safety and health performance. Most know there is a problem. Safety Solutions has surveyed thousands of corporate leaders and health and safety professionals on the question, "The OSHA incident rate is an accurate measure of safety and health performance". Every single group survey has responded negatively to the statement. There is widespread recognition that relying primarily on the OSHA incident rate as a measure of performance is a mistake. The problem is that organizations want to find more effective measures but are not sure what to do. If safety and health isn’t the absence of injuries and illnesses then what is it? Safety and health is an emergent property of the system. Safety or the lack thereof emerges from the complex interaction of many factors such as leadership, technology, processes, work practices, culture, and system deficiencies and strengths. Understanding the concept of system emergent properties is very important. Think about the human body. Examples of our body system's emergent properties include our ability to see, think, walk, write, etc. No individual part of our bodies can do these things. Only our whole bodies can do them. In the same way, safety and health is an emergent property of the workplace system. Safety is not found in an individual part of the system a person, device, procedure or training program. Safety and health is a product of the interaction of parts of the system – the management system, people, work methods, hazard controls, procedures, supervision, tools, equipment, and many other factors including culture, production pressure, resource constraints, goal conflicts and system deficiencies and weaknesses. System performance, in this case, health and safety, is not the sum of these system parts but rather the product of their interaction - how the parts fit. Unfortunately, most efforts to improve workplace health and safety are directed at improving the parts taken separately and insolation of other related and interdependent parts. Efforts would be more effective if directed at the interaction of the system parts, for example, information flow, communication, integration, etc. The Russell Ackoff video below is a compelling presentation on why most improvement processes fail. This message has a clear application to current health and safety improvement efforts. This video is a game changer! Enjoy. 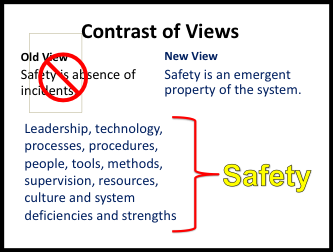 The new view of safety is the application of systems thinking to workplace safety and health. An understanding of systems and the concept of emergent system properties is foundational. Traditionally there has been a tendency to not only focus on system parts in isolation of their interaction with other parts but also to identify, evaluate and 'control' conditions and human performance (behaviors) in isolation. Such an approach is fundamentally anti-systemic and leads to continued failure, conflict, blame and waste of resources. The efforts are well-intentioned, recommended by dedicated personnel and carried out by committed individuals. What is meant by context? All human work performance/activity is carried out in imperfect sometimes severely degraded systems. Frequently the work is performed generally using the proper tools and methods and with adequate resources. However, in every steel mill, auto plant, hospital, power plant, transportation company and construction site workers adapt and make the system work without the proper tools, equipment, procedures, staffing and supervision. They are overwhelmingly successful. Unfortunately, at times things go wrong and someone is hurt, gets sick, equipment is damaged, etc.